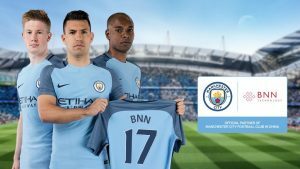 Manchester City has extended its sponsorship deal with BNN Technology, a London-listed Chinese technology, content and services company. Originally agreed in January 2015, the agreement will now also include developing coaching programmes, providing ‘money-can’t-buy’ VIP experiences for Chinese football fans and offering competitions through the Xinhua News mobile app. The new partnership will also see BNN’s Chinese operating partner NewNet work with City to manage a new programme of four football clinics in China. City has one of the largest social media followings in China of any international club, with more than eight million followers on Sina Weibo, the Chinese microblogging website.